So What is Wrong with America and So Right with Canada? I asked myself why Canada has no School Shootings, No Concert Shootings, No Church Shootings, and Mall Shootings? Why are they without so much violence in their everyday lives and why does America have 33,000 deaths a year and Canada, all most none. What is the difference? Canadians have lots of rifles and guns. They do lots of hunting of deer, caribou, quail, sometimes bears, and even wolves. So why is it we have so much violence everyday in our lives, in every city, town, and community in America. The difference is they have smart, common sense gun laws, they have diversity from every country, they care about their children’s lives, their families and friends. So, what is wrong with America?The Canadians have no weapons of war – no AR 15s, no AK 47s for one thing. They don’t hate you for the color you are or what religion you are or how much money or power you have. So which country is more democratic: Canada! They also don’t have people dying without healthcare, although the wait line may be longer, kids don’t go hungry, they have good safe schools. So, what is wrong with America? A lot! KILL OR BE KILLED, WORSHIP MONEY, and HATE WITH VENGEANCE! 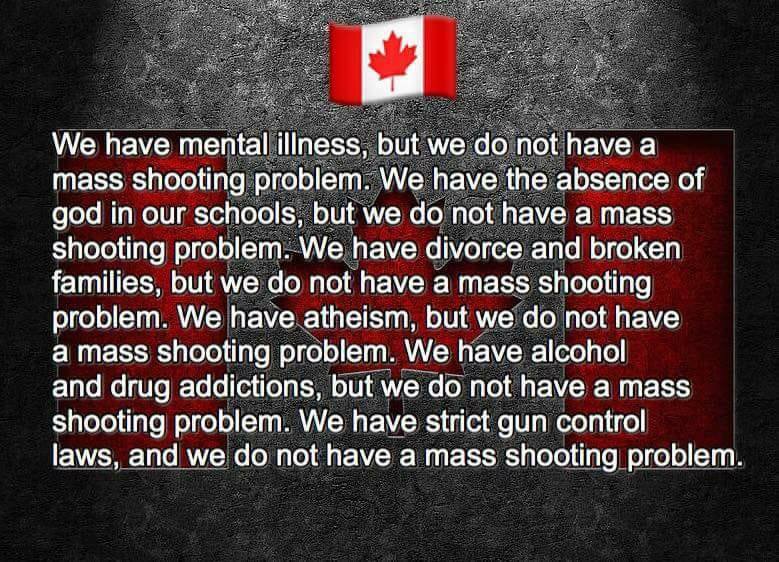 ***I would like to thank Debbie Gies for the photo of Canada life, with good gun laws that prevent mass shootings shown upon, she had it on her Facebook page and now it is here. Thank you Debbie! She is so wise and smart! We need to make some big changes here in America. I’m praying for them to happen soon. Yes, I agree with you so much. I hope these brave kids make so much difference and many are of voting age now and all the other juniors and seniors well, no doubt be able to vote in 2018 and 2020. The only way for real change is by voting! That’s right and they have many voting years ahead. I think it is disgraceful that some of the politicians including our pres. are calling them actors. They should realize soon they will hold the power to remove them from their high horse. We need to get back to the people our government is supposed to be of, by, and for. We need to end the Russian Attack on and infiltration of our government. I don’t know how or why such deplorable people took control of our lives, but I do know we’re doing our best to free ourselves of them. Hi Robert, yes, I hope we do! As a Canadian, I follow your issues and it makes me so sad. Sickened by it all really. I recently experienced first-hand, the inadequate healthcare issues when an American family member passed away and he had private health insurance. It all makes me so grateful to live where I do and I pray every day that your POTUS is impeached. We’re not perfect but I’m thankful. Honestly, this to me is a legal issue. Politics makes no sense. As a Canadian, it seems to me, legalities are where freedom is fought & won, politics hinders more than helps it seems. The tragedies of these mass shootings is a heavy weight here to carry, I can only imagine the frustration of it were in the country I lived in. We do have violence & prejudice & injustice. Everywhere does. One school my kids go to was in lockdown last week. So, there is fear of something major happening here too. But weapons of war in the hands of the people is just plain stupid & irresponsible. I am thankful I live in Canada, because of the laws, not necessarily the politics, and I never take them for granted, these things are fragile and you never know when your rights, freedoms & peace will be robbed from you. Hope your country gains some headway in this battle soon. It is heartbreaking even from the outside looking in. Karen, I stopped by to catch up on your blogs and saw the image and remembered I posted in on FB. Thanks for sharing and mentioning my name. Yes, I am Canadian but my heart has always felt like home in the U.S. I belong to a few political groups with my American friends and I am a justice fighter. I sign petitions and talk politics a lot so even though I don’t live there, I feel for all of you and am watching the U.S. crumble with sadness in my heart. But don’t despair. Justice will be served. And the next generation, the ones standing up right now, will take back the country. And when all those GOP (Government of Putin) are gone and jailed, the world will once again open their arms to the USA. The world is watching. And they aren’t watching fake news!